We have been already blessed with a few hot days in Ireland this Summer, and I don’t know how I would survive raging 19°C heat without ginger beer. It is a very fizzy, sharp-flavoured, refreshing drink and the most Summery of all fermented sodas. I hope you grasped the difference between ginger beer, ginger bug, ginger ale and ginger plant that I explained in my previous post. If you did, go ahead and read my ginger beer recipe. Non-alcoholic ginger beer is made in a similar way as water kefir, i.e. by placing special grains in sugared water, but in this case, we add pieces of ginger as well. Alternatively, ginger beer can be made from so-called ginger bug – a colony of wild yeast obtained by wild fermentation of ginger. I use the first method to make ginger beer because of being in possession of a very good quality ginger beer plant. Ginger beer plant (GBP) looks very similar to water kefir grains but not the same, and it indicates a different microbial composition. Therefore, if you consume both kinds of drinks, you supplement your gut flora with a variety of microorganisms. Also, you get all the benefits of ginger, like soothing the stomach, stimulating the circulatory system or reducing inflammation. Boil the water in a pot. Add sugar and chopped ginger and simmer for about 10 minutes. Cool down to the room temperature, pour everything into a sterilised jar with GBP and stir well. You can leave the ginger out as the water is infused with ginger, but the final drink won’t be very fizzy. At this stage, you can add a bit of lemon or lime, but it will make the grains slimy, so I suggest to do it at the secondary fermentation. Cover the jar with a piece of cloth or paper towel and leave in a dark, rather warm place. After 2-3 days, check the smell of the mixture. If it smells nicely sour, your beer is ready for bottling. To bottle the beer, just run all the jar contents through a plastic sieve and pour all the liquid into a flip top bottle adding a slice of lime or lemon, if you haven’t already done so for the primary fermentation. You will have your GBP left on the sieve, and you just have to use it for a new batch. The chances are the beer will be already very carbonated, so you can put the bottle straight into the fridge. If not, keep the tightly sealed bottles in a dark and warm place for a few days to allow the yeast present in the beer to transform the rest of sugar into CO2. This is what we call the secondary fermentation. Remember, the higher the temperature, the faster the fermentation. So, consider skipping the second stage or make it very short if your kitchen is very warm. And be careful when opening the bottles. It happened to me, on more than one occasion, to experience the champagne effect performed by my home made sodas and flood the kitchen floor. 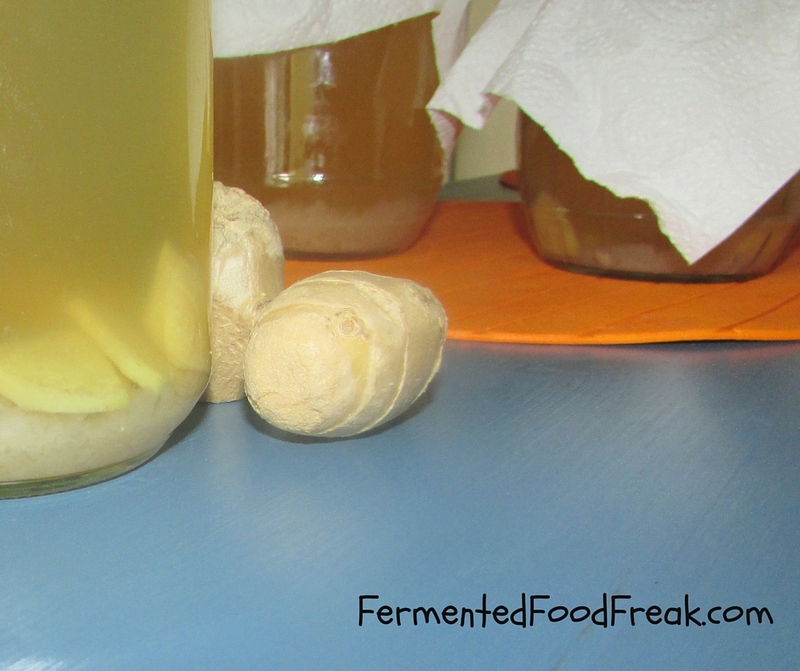 It is not true that if you keep fermenting ginger beer in an open jar, you will eventually get alcoholic beer; it will only turn into vinegar. See the proper recipe here. Non-alcoholic ginger beer is a delicious, healthy alternative to artificial soft drinks and really worth making. If you don’t have the proper grains, check the recipe how to make a ginger bug that can also be used as a starter. Enjoy and have a beautiful Summer! Wow, how great is this recipe! I love ginger beer! Thank you, Peter! It must be delightful to drink GB during a proper Australian Summer! Next Next post: What is Real Bread?